Calling a cellphone a mere phone seems a little silly these days. The little pocket wonders now do so much they are really handheld computers. With extras. The process of mashing one or more gadgets together in the same box used to be called convergence, but that approach quietly died as the mobile phone ate up any and every rival device. So successful has this been that whole product categories have had the life choked out of their twitching bodies by the phone. The following list is an obituary to five of them, plus a look at the cellphone's next victim. Remember the PDA? 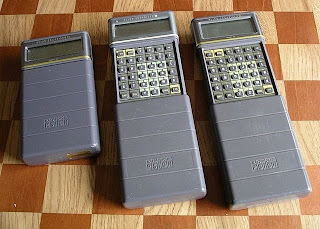 Right back to the Psion Organizer in 1984 (above), the PDA has essentially been an electronic calendar, address book and notepad. And right back to the Psion, with its squishy, non-QWERTY keyboard, they've been harder to use than their paper equivalents. Still, despite this, it took the cellphone to finally kill them off. The fatal shortcoming? The address book. Who on earth would take out their PDA, call up a contact and then tap the phone number into their phone? Nobody, which is why, as the calendaring functions of phones got better, the PDA was quietly retired. We're not saying that the standalone camera is dead. Far from it — one look in the street will show you how popular is the modern DSLR. But for people below a certain age, the camera phone is the one they use, and it has already killed off the cheap, junky bottom end of the digicam market. It's easy to see why: Although the pictures from the small sensors might not be great, the camera phone is always in your pocket, and you can snap and send pictures over the network in seconds. This convenience more than makes up for the noisy pictures. Remember the saying: The best camera is the one you have with you. The Ultra Mobile PC was a failed experiment, although once in while a company will drag the rotting corpse from its comfortable grave, slap on a bit of makeup and try to sell the idea again. The reason? Cellphones. Think about it: The UMPC was a full-fledged computer crammed into a tiny box with an impossible-to-use keyboard, with pathetic battery life and a hilariously high price tag. The phone, in contrast, offers an operating system and interface designed for the modest hardware on which it will run. It's cheap, and the battery lasts for days. Better still, phones are only getting more powerful. The iPhone and the G1 are both handheld computers which happen to have a phone attached. And if you really do need a bigger screen, you can pick up two or three netbooks for the price of one UMPC. We still keep these old tethered phones around, for calling the emergency services if nothing else, or because its cheaper to buy an all-in-one package from the local telco. But the main phone for many people is the cellphone. Part of this is the convenience of always having it with you, even in the house. But we think a bigger part is that the humble telephone just hasn't kept up with technology. The handsets just don't have the features we're used to. And when we do use a land line, we look up the number on our cellphone and then type it in. Small wonder that most people just press the green button on the mobile instead. Almost every phone comes with an MP3 player. We guess that in a few years, even the iPod will be dead, replaced entirely by the iPhone (and the iPod Touch, which is really just a cellphone without a phone). Music playback and a headphone jack is now a standard feature on even the cheapest of handsets (with some notable exceptions). Our prediction? The MP3 player will join the PDA in the gadget graveyard within a few short years.